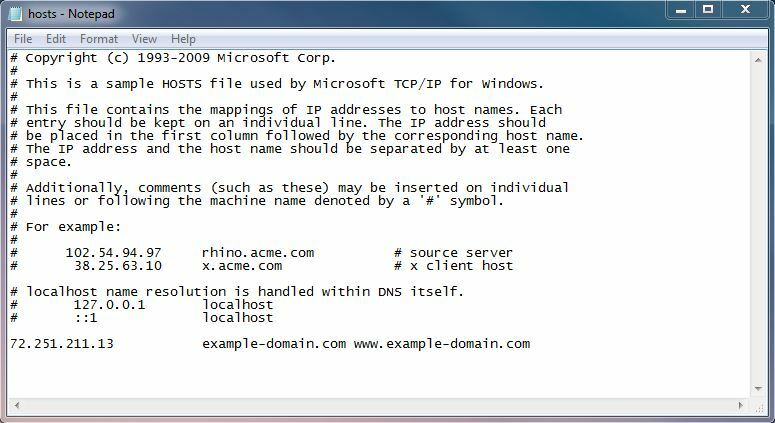 A hosts file is basically an address book which is consulted every time you browse (or connect) to a domain. It acts by converting user friendly address names (e.g. www.layershift.com) to their corresponding IP address which aren’t that easy to recall. If the address is not found within your hosts file then the request is passed to your configured DNS server(s) to be resolved. By editing your local hosts file you can force your computer to load a domain from the IP address that you specify, you can get the IP address for your site from within your Plesk Control Panel. It’s extremely useful as it can allow you to view development or test sites to fix any potential bugs or problems without making the site ‘live’ by altering any DNS zones. It’s important to note that altering your hosts file will only affect your computer and not the live sites! Each entry should be on a separate line. The IP address should be in the first column. The domain name should be in the second column. In the example, after saving the file, your browser will be automatically directed to the ‘72.251.211.13’ IP address when navigating to either ‘example-domain.com’ or ‘www.example-domain.com’ . Once you’re done working on the development or test sites, you’ll need to remember to remove the entries from the hosts file and save it in order to access the live sites again. How can I make sure it’s the new server? 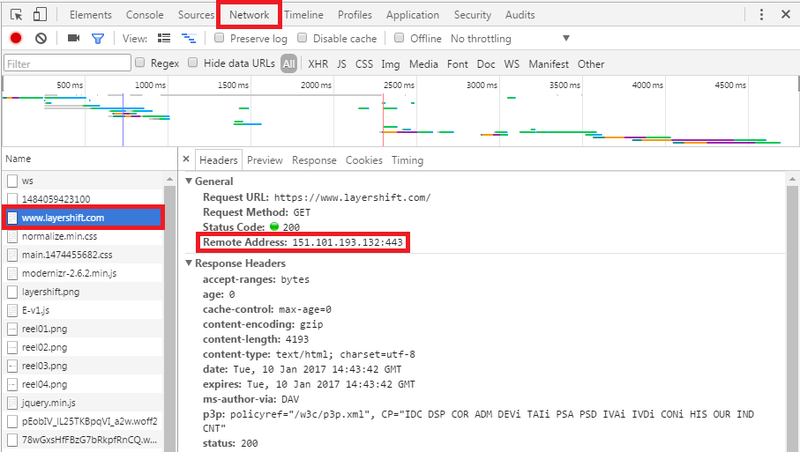 After editing and saving your hosts file, your browser should automatically make new requests for content to the new server / IP address that was specified. However, you can always double check the server IP content is loaded from by using Developer Tools in your browser. Below you can find the steps for checking this in Google Chrome. Open a new tab in Google Chrome. Click on your domain name (‘example-domain.com’) in the Name column in the populated list. Verify the origin server IP for the resource at Remote Address. If you prefer to use Mozilla Firefox, you can use Ctrl + Shift + E to open the Network tab of developer tools directly, which works in a similar way.